In a medium saucepan over medium heat, add oil, onion, garlic, carrot and celery. Stir cook for 5-10 minutes until vegetables are soft and start to take on colour. Add the port or sherry, canned tomatoes and the bay leaf; bring to a boil then reduce heat. Simmer uncovered for 10 minutes, stirring occasionally. 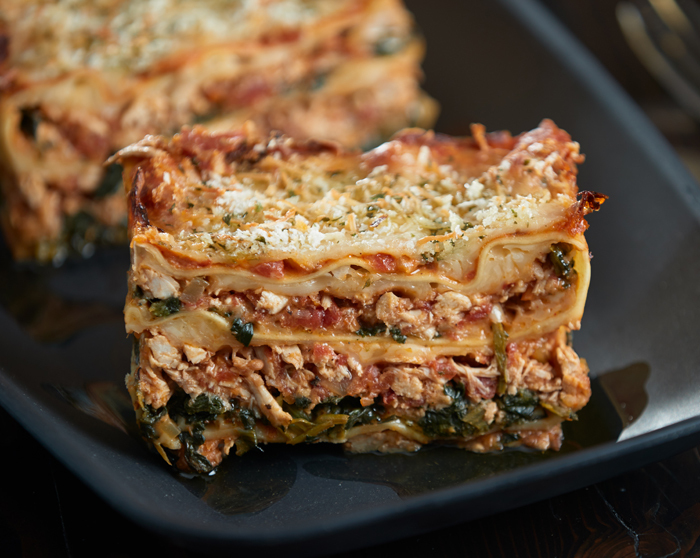 Stir together spinach, 1 cup of Italian cheese, 1/2 cup rosa sauce, and ¼ tsp. salt. Set aside. Line a standard loaf pan with foil, leaving an extra inch or so of foil extending over the rim on all sides. Repeat the process with the remaining ragout, the rest of spinach mixture, 1/3 cup Italian cheese and a third noodle layer (may not use all noodles in the package). Press down firmly. As seen on Great Tastes of Manitoba 2016.